Dr. Peter Goldmark, CBS’s engineering wizard, is always dreaming up a revolutionary invention—whether it’s color TV or 3 “mad” Russians. THE Columbia Broadcasting Company has on its payroll an amazing genius who could figure out a practical system of interplanetary travel—if he didn’t divert so much of his talent to plotting new practical jokes. His colleagues give Dr. Peter C. Gold-mark, Columbia’s director of Engineering, Research and Development, sole credit for developing color television. A long-range problem, you think? 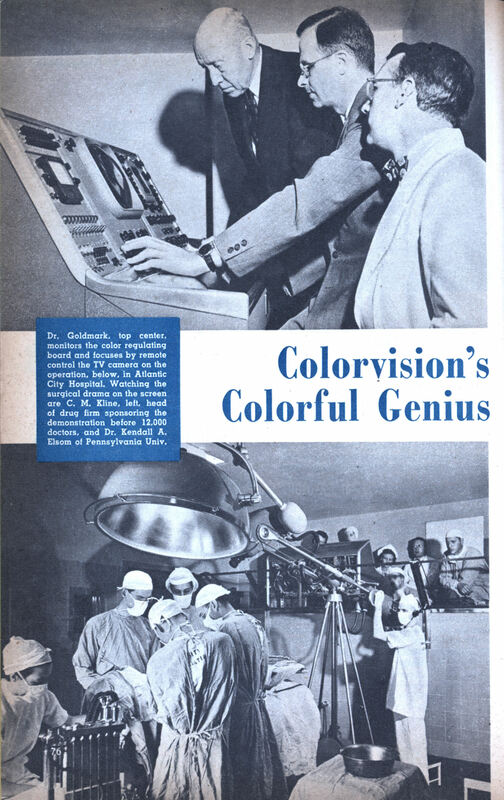 Dr. Goldmark first began to think seriously about “colorvision” while he was watching the movie, Gone With the Wind. Before Rhett Butler finally had given Scarlett O’Hara the heave-ho, Goldmark had worked out the solution to color TV. Exit Dr. Jekyll. Enter Mr. Hyde. Some Russian engineers (nobody was worrying about atom-bombing anybody in those days of happier international relations) were invited by CBS to look over Gold-mark’s invention. At the appointed time, three weird characters in flowing black beards, fur hats and colorful silk pants were ushered into the studio. Then, as the genuine guests were announced, these three “mad” Russians scurried for cover. In the rush a beard fell off—and revealed the shining countenance of the colorvision inventor himself. Last summer 12,000 members of the American Medical Association, meeting in Atlantic City, were treated to a remarkable demonstration of Goldmark’s color television. Under the sponsorship of Smith, Kline and French, Philadelphia drug manufacturers, and, with the cooperation of the University of Pennsylvania’s medical staff, his color equipment was set up in Atlantic City Hospital and in the convention hall. For four days, surgical operations were color-televised from the hospital directly to the hall! But while preparations for that event were going on, the tall, bespectacled inventor had been hard at work on less constructive ventures. Loosening door hinges, for instance. Once when an official came rushing into his office, both official and door fell most unofficially on the floor. Or carbonizing the earpieces of CBS telephones. Anybody from an office boy to vice president may [Continued on page 150] have been walking around CBS unaware of the black smudge, or “Goldmark earring,” he was wearing. One day when he got bored with the black tie that a colleague constantly wore, Gold-mark organized a band of anti-black-tie vigilantes. Suddenly they pounced on their startled victim and pinned him down on the floor. Then they snipped off the offending tie just below the knot and replaced it with an enormous comic bow-tie. Before the victim could recover either his poise or a respectable neckpiece, Goldmark arranged to have him called immediately to the office of one of the company’s most solemn vice presidents. Such shenanigans don’t keep the poker-faced physicist from driving his laboratory at top speed. One day in 1945, the CBS executives told Goldmark that people were complaining about phonograph records. The albums took up too much room, and there was an interruption every three or four minutes while the record was changed. They gave him their usual detailed instructions: “Do something!” ‘ Goldmark did something: He revolutionized the record industry. The concrete results appeared in 1948 in the form of Columbia’s Long-Playing Microgroove records. Gold-mark solved the interruption problem by providing 45 minutes of playing time on a single record. In terms of shelf space, he compressed eight feet of music into a little more than a foot. During the LP’s first eight months, the public snatched up more than 2,000,000 of these records. During the war, Goldmark and his laboratory were shipped to England with orders to concoct a gimmick to jam enemy defense radar during bombing missions over Germany. The Third Reich offered a 5u,000-mark reward to the German scientist who could come up with effective counter-equipment against this jamming. But that rich prize went unclaimed throughout the war. Of course, war or no war, Goldmark had to amuse himself. Just before a scheduled conference with Army and Navy brass, a member of Goldmark’s group bought himself a colorful pair of Bermuda shorts, then returned to his office to try them on. While he was inspecting his knobby knees, Goldmark gleefully rushed in and stole his trousers. The conference took place with an exposed pair of hairy legs fidgeting uncomfortably amidst gleaming British and American gold braid. Fortunately, Goldmark doesn’t spend too much time rubbing limburger cheese on other people’s radiators or suspending water buckets over doorways. Recently, radio sponsors complained that by the time they received a Hooper, Nielsen or Crosley rating on their shows the news was a few weeks old. Goldmark and his team went to work. They came up with a system called Instantaneous Audience Measurement. This arrangement, based on a radar principle, lets a sponsor know at any given moment how many sets are tuned to his program. And still another Goldmarkian gizmo gives the listener a chance to “talk back”—via a series of buttons which register approval or disapproval. The man behind these inventions comes by it naturally. For although he was born in Budapest 39 years ago, the Goldmark strain was making its contribution to America long before that. His great-uncle was the inventor of percussion caps, first used in rifles during the American Civil War. Goldmark’s rendezvous with television destiny began after he obtained his doctorate degree from the University of Vienna. He worked on the early British television experiments until the depression put an end to them. Then he followed TV to America. Hired by CBS, he quickly moved up to top man on TV’s totem pole. In Goldmark, the New World obtained an amateur, as well as a professional, doodler. For doodling with mechanical gadgets is both a hobby and a living for the inventive wizard. His first purchase as a newcomer to this country was an electric razor which he immediately took apart, then put together again so that it worked much better than the original model. No ballpoint pen left alone in his vicinity has much chance of going through life in the form it began. Friends visiting Gold-mark’s home in New Canaan, Connecticut, have learned to play safe by leaving their cars a good distance from the house—out of range of their host’s penchant for prankish tinkering. As a matter of fact, he made the air-conditioning unit in his house out of parts of an old Ford. His home is his sparetime laboratory. He chose the site only after he made sure that it afforded good television reception. Dr. Goldmark’s sentence drifts off. You can see that the colorvision genius’ active brain suddenly has become feverishly busy planning a revolutionary invention—or just another practical joke. The funny thing is that DLP projectors have brought Goldmark’s idea back, after a fashion: a color wheel spins across the DLP mirrors to produce the fields. This is why some people see a “rainbow effect” on DLP-projected images, especially if they move their eyes or heads quickly. He didn’t really invent sequential color. Movies first used the spinning color wheel idea back in 1912. What really killed the color wheel was scale. 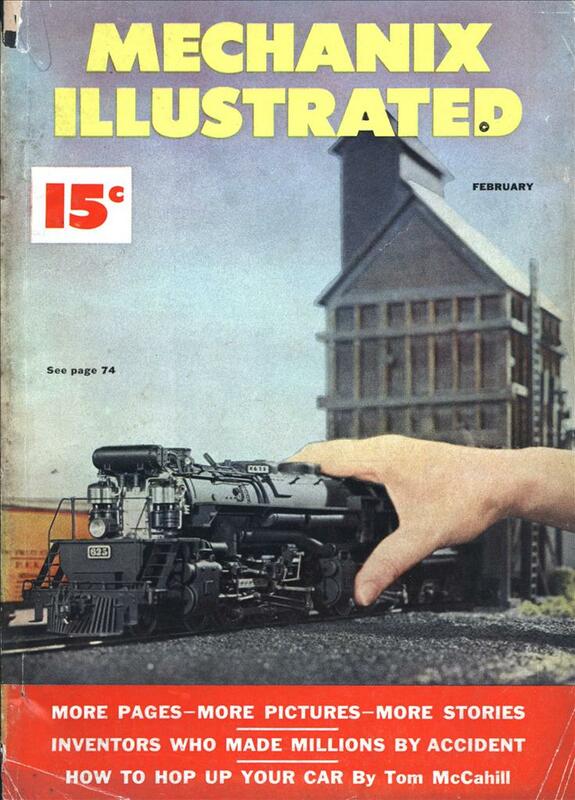 It’s easy to put a wheel on a DLP or a 5″ CRT, not so easy for 19″. 16:9 screens today would be a horror to put a wheel on. If sequential color had remained the standard, I imagine the wheel would have been replaced by some sort of tri-color display and electronics. I remember seeing an announcement of a system that used a color wheel on a monochrome tube with electronics that converted NTSC to sequential fields. set. Even with vacuum-tube electronics the counting system would have only needed a few tubes. 1) This means the 3DTV system with the best 2D compatibility will probably become the standard. and alternating polarized light LCD illuminators. The Phillips 3DTV system (See the YouTube) is goggle-less but has less backward compatibility. It’s meant for point-of-sale store displays anyway.